Top-Rated SellerAstad consistently earns high ratings from buyers thanks to fast shipping and excellent service. Price paid plus return postage will be refunded for items returned because of seller error (item significantly not as described, wrong item sent). Price paid minus the s/h charge will be refunded for all other items returned at buyers expense in condition sent. Returns must be postmarked within 7 days of receipt. 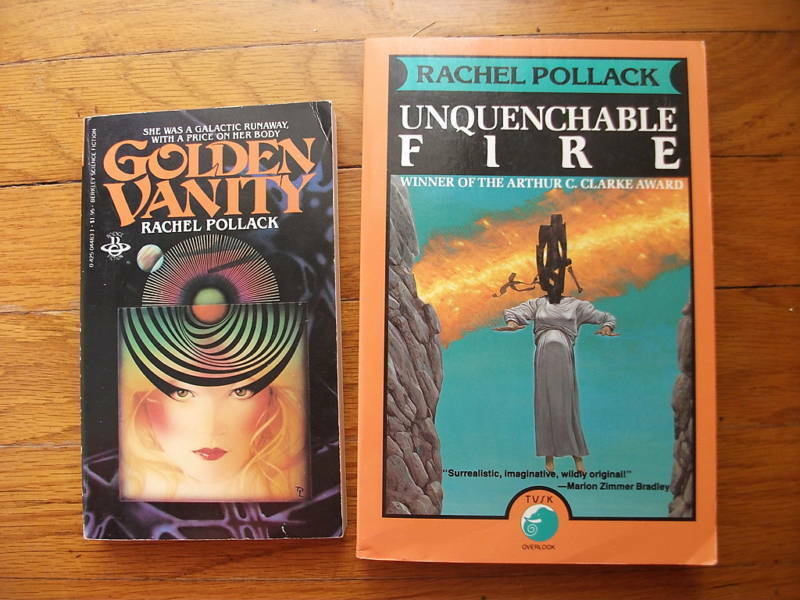 Two Softcover Books by Rachel Pollack Golden Vanity: Berkley Books, 1980. Mass market paperback book in VG condition - tight and square and unmarked. The cover has light wear at the edges and folds and a small crease across the top front corner tip. The spine is uncreased. The book is yellowing. Unquenchable Fire: Overlook Press, 1992. Large format softcover book (trade paperback) in VG condition - tight and square. There are a few small dirt specks on the closed page edges and on the title page. The cover has light wear at the edges and a small crease across the bottom front corner tip. The spine is uncreased. This book won the 1989 Arthur C. Clarke Award. aij Media mail shipping with delivery confirmation is free to all U.S. addresses (including APOs). We will ship to most countries. Please contact us if you need a shipping price quote. Please take a minute to check out our other items for sale. We strive to bring you quality used books at good prices. We offer literary fiction, book club titles, mystery, fantasy, sci-fi, kids books and much more. Only a small fraction of our books are listed online. If you don't see what you are looking for, or if you would like us to customize a group of books to fit your needs, please let us know. We're here to help. We are not a giant superstore. We are two book-loving sisters who have been selling books online since 2001 and are proud of the record we have built for ourselves. We encourage you to check our feedback before buying and to feel free to email us with any questions. Book Grading Guidelines: Ex-library books, Book Club editions, and remaindered books will always be identified as such. We try to describe each book we list as completely as possible. Although we may not mention every spine crease or scratch, we make every effort to make note of all significant defects, including bookplates, writing or markings, and strong odors. The VERY GOOD and GOOD categories may be modified with a plus () or minus (-) sign to signify that the book(s) being described falls a little bit above or below the usual book with that grading. LIKE NEW / AS NEW: Item could easily be mistaken for brand new. The book is tight and crisp with perhaps minor wear along the book's exterior edges. No missing pages, and all pages are undamaged with no creases or tears. There are no markings of any kind. The only signs of wear may be minor rubs or scuffs to the cover or jacket from shipping, or lightly bumped spine ends or corners from shelving. FINE: Some evidence of slight wear. Approaches the condition of LIKE NEW, but without being as crisp. This copy may have been opened carefully one or twice, resulting in a light reader's crease (a crease along the edge of the cover by the spine) or minor stress lines on the spine. The binding is still tight. Cover or dustjacket may have minor rubbing; hardcovers may have lightly bumped spine ends. NEAR FINE: This grade signifies a book or dust jacket approaching FINE but with a couple of minor defects or faults. Original cover lamination (if any) may be slightly peeling at the corners. Edge staining (if any) could be slightly faded. Pages are largely white but may show browning around the edges. No major creases or bends are in the covers. The book or jacket may have lightly bumped spine ends, a small amount of rubbing wear, or light wear showing on the jacket or board edges. There will be no tears or markings. An assortment of minor indications of wear may be present, but the book remains a very nice copy. VERY GOOD: The book is obviously used but is still fairly tight and structurally sound. There are no missing pages. Any noticeable wear is not major. There may be some light wear, soiling, fading, or yellowing, depending on age. Cover luster/gloss may have faded or plastic lamination (if any) may be peeling in spots. There may be slight bends or creases on the cover of softcover books. There may be a small amount of marking inside the cover or on an end page (i.e. previous owner identification, bookstore stamp) but there is no underlining or highlighting of text. The spine may be bent from several readings but will show no more than a moderate amount of creasing. Softcovers or board edges may show light edgewear. Jackets may show a little rubbing or crinkling at the edges. Any tears or chips in the jacket will be identified. GOOD: A typical "used" book. This book is showing signs of wear and use, but remains structurally good. There may be foxing, yellowing, or similar age-toning. The cover or jacket may show some wear – fading, soiling, loss of luster, creases, scratches or small tears. The spine of softcover books may be slanted and will likely have moderate to heavy creasing. The majority of pages are undamaged (minimal creases or tears). This book may have some markings – bookstore stamps, previous owner identifications or minimal underlining of text. A dust jacket rated good will likely have some tears or missing chips. ACCEPTABLE (FAIR / POOR / READING COPY): A worn book that has complete text pages (including those with maps or plates) but may lack endpapers, half-title pages, etc. Possible writing in margins, possible underlining and highlighting of text. May be soiled, scuffed, stained, or spotted, and may have loose joints, hinges, pages, etc. The book is in the lowest usable condition. Jacket (if any), may have large tears or be incomplete. Thanks so much!